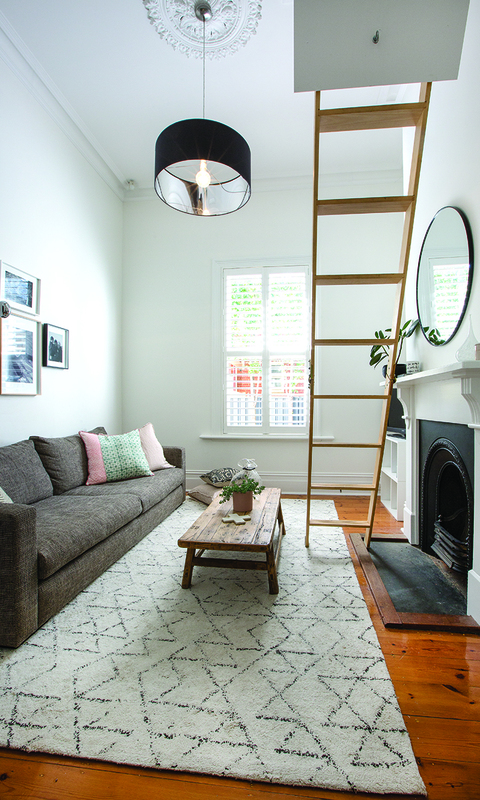 It’s natural to want to make a start on renovations as soon as you move into a new house but, as this character villa extension shows, good things come to those who wait. Parallel timber battens create a striking architectural feature in the extension, as the roofline angles upwards out to the garden, while each piece of the light European oak parquetry was laid individually. As with many of Parkside’s early 1900s villas, this home had already been extended when Sean and Rebecca Ryan moved in 10 years ago. However, the 1990s build didn’t allow sufficient light into the home or create enough space for the family. The Carrara marble kitchen bench is mounted on pale American oak joinery to create an informal dining area, contrasting with the matte black two-pack cupboards. As an architect, Rebecca immediately saw an opportunity to create a more inviting open plan kitchen and living area, but ended up waiting several years before work began. “Initially our plan was to extend and renovate straight away, but I was too busy designing everyone else’s houses! Before we moved in we had grand plans, but we refined them over the years. The floorplan provided a multitude of options so it was a bit of a blank canvas really, which many villas are,” says Rebecca. A concealed door to the laundry and powder room opens in the batten wall of the dining room. A large artwork makes a pop of colour in the spacious playroom, which was created in a converted garage space. The front of the property also received thorough redecoration, with stylish new joinery added to the master bedroom, once the living room of the original villa. 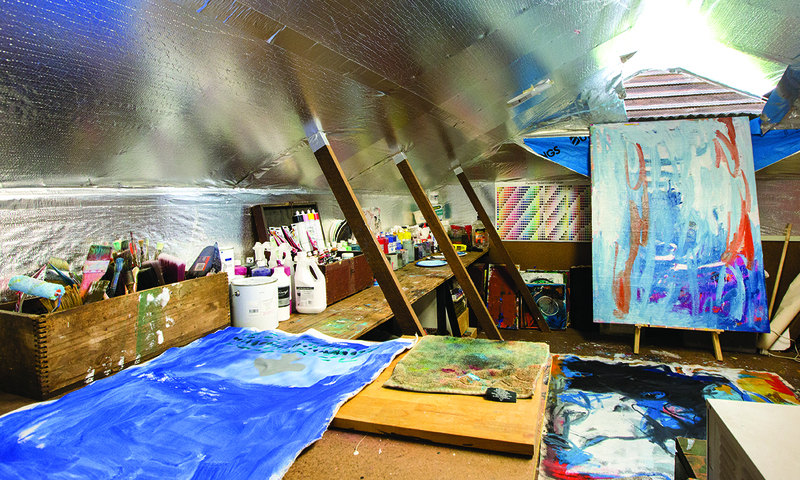 They even found a way to use the roof space of the house, creating an artist’s studio for Sean tucked away in the rafters, accessed via a loft ladder. BTF Construction began the new extension in September 2016 and the project was at lock-up by Christmas. Rebecca managed the internal fit-out herself, with final completion in May 2017. The family say the renovation was painless; in fact they thoroughly enjoyed it. A temporary kitchen was set up in the smallest bedroom of the villa. “It was brilliant; one of my friends remarked that it was like a Parisian apartment. Sean created a little garden down the side of the house where we ate and entertained, with candles and tree lights all around. It was like one of those pop-up bars in town,” Rebecca says. The full-height windows looking onto the garden capture maximum light, while the overhanging roof and exterior walls shade the room from direct sun. A section of the original extension was retained, with an eye-catching feature of parallel timber battens employed to conceal a necessary loadbearing beam. “In the end we used as much of the existing structure as we could. So in order to avoid the beam becoming a feature, I added pieces of timber, to disguise it. Then I wrapped the timber down the wall because I didn’t like the idea of the laundry coming off the dining space. So I made that a secret door to hide what’s behind.” Rebecca credits the perfectly invisible door to the hard work of carpenter Eddie Bevan. Bespoke joinery has been installed in the master bedroom for ample storage, with French doors opening onto a garden at the side of the house. Removing a low verandah that once ran along the north-facing rear of the house revealed how much heat the summer sun brings. 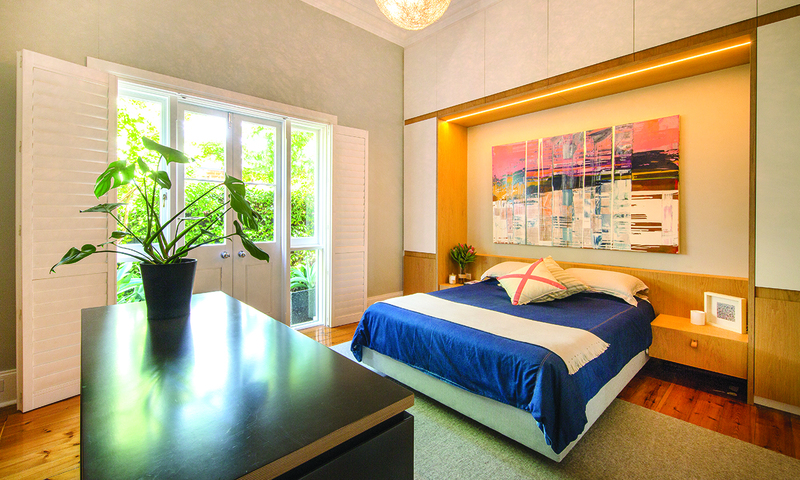 Rebecca’s striking architectural solution creates a much lighter and brighter, yet cooler, space. The roof of the extension angles up away from the house, with exterior overhangs that block direct summer sun from above, and the east and west. Windows onto the garden stand the full height of the extension, from lawn to sky. The period villa has retained its character street appeal. The long interior hallway, complete with archway and stained glass, is a classic feature of early 1900s villas. Large windows in the side of the extension slide all the way back into the exterior wall to create an indoor/outdoor bench seat adjoining the patio and pergola. The bench seat was one of Sean’s “must haves”. The roofline of the new extension dominates the rear aspect of the property, which opens onto the garden from every room. Windows in the side of the extension can be pushed back to create an indoor-outdoor bench seat between the living room and the patio. This article was first published in the May 2018 issue of SALIFE.